Orlando Speedworld is the third different Florida race track that Formula Drift has visited in the past three years, but it definitely has its own character. While Palm Beach International Raceway (2011 / 2012 / 2013) and Miami-Homestead Speedway (2014) both raced on modified road courses, Orlando Speedworld is a 3/8-mile banked oval that is bigger than Wall Speedway’s 1/8-mile oval (that will be the fourth stop on the Formula Drift circuit) and smaller than Irwindale’s 1/2-mile oval that will finish the season. The course is only two turns, but the uneven pavement on the infield that some have referred to as a ‘WOOPS‘ section similar to a motocross track is an added hazard drivers will need to plan for. The first banked turn is piloted clockwise with an outer zone along the wall for the entire bank. As the drivers exit the bank, an inner clip sits at the start of the infield. Drivers will transition from one direction to the other across the infield, stabilizing their car through the ‘WOOPS‘ section and hitting a second inner clip before ridding the second outer clipping zone around via the apron of the opposite turn in counter-clockwise rotation. Ken Gushi topped a field of 38 drivers in qualifying in his GReddy Racing Scion FR-S with Matt Field earning second qualifier and missing the top position by only a single point. 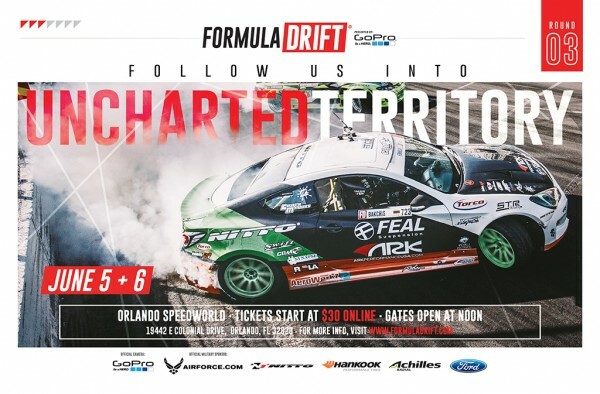 Ryan Tuerck, Justin Pawlak, and Tyler McQuarrie earned third, fourth and fifth qualifiers respectively, all also only earning one less point than the driver ahead of them.